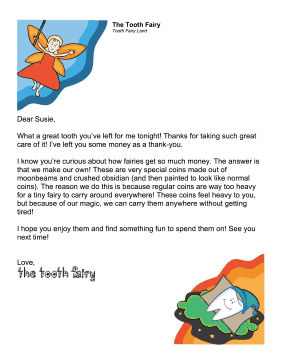 Where does the tooth fairy get all that money from? This printable letter provides the tell-all. What a great tooth you've left for me tonight! Thanks for taking such great care of it! I've left you some money as a thank-you. I know you're curious about how fairies get so much money. The answer is that we make our own! These are very special coins made out of moonbeams and crushed obsidian (and then painted to look like normal coins). The reason we do this is because regular coins are way too heavy for a tiny fairy to carry around everywhere! These coins feel heavy to you, but because of our magic, we can carry them anywhere without getting tired! I hope you enjoy them and find something fun to spend them on! See you next time!